Instabug is based in Cairo, Egypt and was founded during Omar Gabr and Moataz Soliman’s last semester at Cairo University. From graduating college in 2012 to graduating from Y Combinator in 2016, the duo built a team, launched an MVP aimed at customers abroad, developed the core product, expanded into an adjacent vertical, grew Instabug’s user base, and secured larger and larger investments. 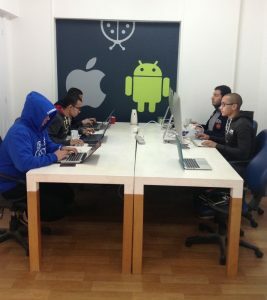 This article is part of a series of blog posts about Instabug’s startup journey — the struggles behind the scenes of the company’s “wins” and lessons learned from overcoming them. Join us on Twitter to follow along on our journey. ‘Make something people want’ is the destination, but ‘Be relentlessly resourceful’ is how you get there. I first heard about Instabug two years ago through a friend who told me about their latest funding round. At the time, it was the biggest investment an Egyptian startup had ever received. The entrepreneurship scene in Cairo was young, but passionate. Every week, you’d hear about a promising new startup that aimed to solve problems and change the world. Every week, another promising startup silently disappeared. And every so often, a startup would achieve a new industry milestone, pushing the entire entrepreneurship ecosystem forward. After joining the Instabug team last year, I wanted to understand why the startup wasn’t part of the 90% who silently disappeared. Through discussions about the company’s history and interviews with various team members, I discovered that the stories about Instabug that are public knowledge are just the tip of the iceberg. There were always more layers, more humanity, and more compelling details behind the scenes. I decided to share these untold stories not only because they are fascinating, but also to document the characteristics about Instabug that make it uniquely positioned to be Egypt’s first unicorn. Instabug’s 2016 investment was announced on TechCrunch, the tech blog where every startup around the world aspires to be featured. With millions of monthly visitors to the blog, being “TechCrunched” means a huge spike in traffic to your startup’s website, and the attention of investors, competitors, peers, and potential customers. Instabug had been mentioned on TechCrunch in three other articles before, but they knew that this time was special. 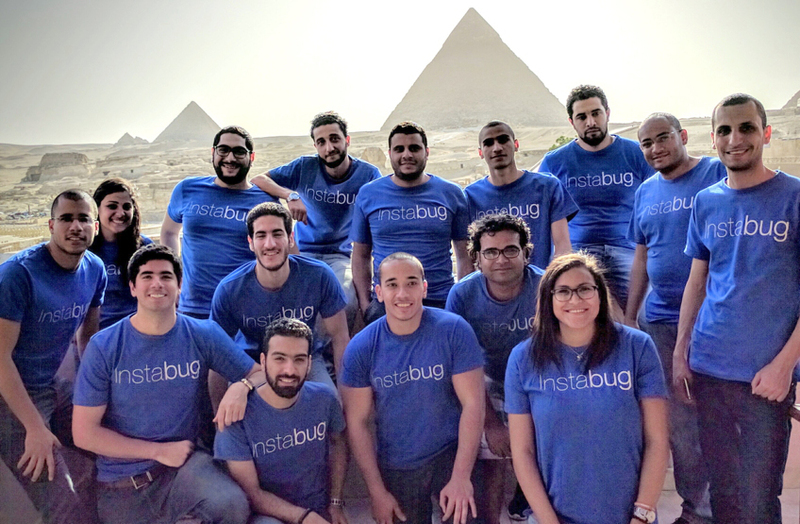 Instead of a photo of the founders or a mockup of the product, as is the usual case, the article featured a picture of the Instabug team in front of the Great Pyramids of Giza. The pyramids picture represents just how “relentlessly resourceful” the BugSquad is. This is the story behind that photo. When Instabug raised $1.7 million immediately after completing Y Combinator’s Winter 2016 batch, the founders were shocked. They believed in their vision and the product and the team, but they didn’t expect to actually raise that much money. “We went to YC with maybe $150,000 from investments in the bank and we were profitable, which meant that we had infinite runway. But at the same time, we didn’t have any space to experiment; we were still capped by the amount in the bank. And then after the seed round, all of a sudden we realized that we had $1.9 million in the bank,” Moataz explained. After Y Combinator, Omar and Moataz returned to Cairo earlier than expected in the spring of 2016. They thought it would take one month after YC to close an investment round before they could go back to Egypt. They closed the round within three days. “We kept refreshing the bank account page and when the money was in there, we decided it was time to get back to Egypt so we could focus 100% on the most important thing: building the product. We had a lot of work to do with the team to move things forward and we wanted to make sure that we brought back that momentum with us and transferred that excitement to the rest of team. We closed the deal on Tuesday, returned to Cairo on Friday, and were in the office on Sunday,” Moataz recalled. One of Instabug’s first offices in Cairo, Egypt. At that time, Instabug’s office was in a small, two-bedroom apartment with thin walls on the Eastern edge of sprawling Cairo. The cramped living room was the 15-person team’s shared workspace, and the bedrooms were used for meetings, interviews, one on ones, lunch, dinner, and FIFA matches. In a room the size of a wide hallway, with screaming kids at the daycare next door and teenagers blasting their music upstairs, Omar announced that the company had secured $1.7 million in a fundraising round led by venture capital firm Accel along with angel investors. “He talked about Accel and Rich Wong, our plans for the future. We didn’t have every single detail worked out at the time, but we knew that we had a lot of money in the bank, so we’d have courage to do new things and make wrong bets to know what we should bet on. And as a company, we knew that we should stay as resourceful as we always have been,” Moataz said. Instabug’s partnership with Accel wasn’t just a milestone for the company, it was a milestone for the Egyptian startup ecosystem. “Working in a startup wasn’t a typical career path in Egypt. But currently, the idea of entrepreneurship as a valid trajectory has grown and it’s pushing people to try new things and work on a global level. Instabug showed that it’s possible,” Senior Growth Marketer Yasmine Helmy explained. 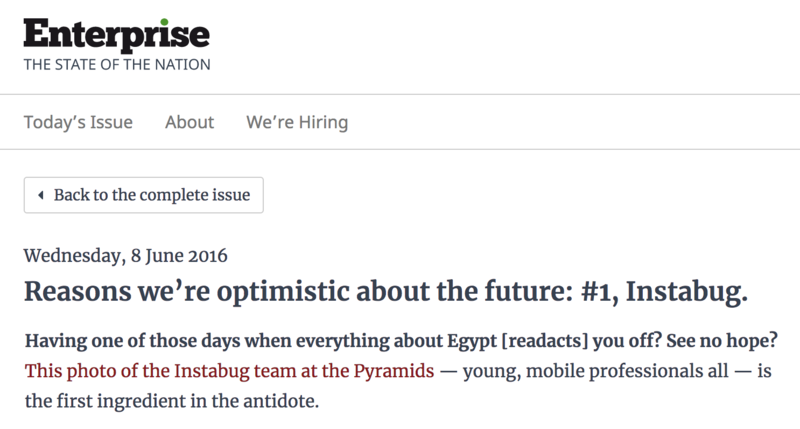 Two months later, TechCrunch announced Instabug’s investment to the world, and the picture of the team at the pyramids spread throughout the Egyptian entrepreneurship scene. Local news coverage of Instabug’s 2016 seed round in which it raised $1.7 million led by Accel. The Instabug BugSquad at the Great Pyramids of Giza in the summer of 2016. Before the TechCrunch article was published, Mike Butcher, the author of the article, asked for an image to go along with it. Omar and Moataz decided that they wanted it to be a picture of the team, the people behind the product. They were also proud of being an Egyptian company that achieved this milestone. They just needed a location. “How about the pyramids?” Omar suggested. To take the picture, the team planned to take a quick trip to the pyramids in the middle of their workday. What was supposed to be a two-hour outing ended up being a full-day mission. But at the end of the day, the team made it happen. So the team decided to wing it. “We’re very resourceful, so we decided to scatter into groups and find a way to get the best shot,” Yasmine said. “We operated just like we did at the office. We worked in groups to tackle a common problem and when we faced any challenge, we looked for workarounds until we succeeded,” Donia explained. One group rode horses into the desert to find a back entrance to the pyramids complex. Others entered with un-branded T-shirts to look for a different way in for the rest of the team. Another group attempted to negotiate with nearby buildings to gain access to their rooftops in order to take the photo. Hungry and dehydrated after hours of searching in the sun, the team decided to take a break and eat at Pizza Hut, which is located right across the street from the pyramids complex. While resourcefulness is a critical ingredient in achieving a goal, sheer luck can sometimes make or break it. “We were starving, so we ordered everything on the menu, but there wasn’t enough space for all of us, so they sent us to the roof,” Nagy said. When the team got up there, they found the perfect view for the photo. Their first choice for the picture was denied, and they spent the whole day unsuccessfully searching for other ways to take the picture, only to find the ideal location by chance. “It looks like we’re at the pyramids, but we were actually on the roof of Pizza Hut and we just hacked the picture,” Nagy told me. The team had finally found a good enough view, but actually taking the photo proved to be another challenge on its own. “We took photos from many angles with professional cameras, but none of them worked. Either you couldn’t see the pyramids or you couldn’t see the team’s faces,” Nagy explained. The solution that worked ended up being the simplest option, although it involved a sacrifice. “It took us several tries to get the shot. We even asked some tourists that were there to take the picture for us. In the end, the picture that was published on TechCrunch was the one that I took of the team just with my mobile phone,” Nagy said. The Instabug case seems to illustrate what much of psychology and management studies have told us for decades: that resilience to adversity and success are positively correlated. One of Instabug’s core values — the standards of behavior that the company culture is built on and that all team members must possess — is “Make It Happen”. Through grit or resilience or luck, make it happen. When I asked Omar and Moataz why Instabug has made it happen this far, they didn’t realize it, but their answers reflected everything these studies have proven. Want to join the journey of building Egypt’s first unicorn? We’re hiring and we’d love to meet you! Check out our current job openings and Apply Now.